What do you think you would play if this were a blitz game? How about if you had all the time to think about it? First of all, let me say I'm glad that I'm not the only one who likes to play chess against the computer! As long as you don't let it turn into a video game but actually try to learn something from it, I think that chess against the computer can be fascinating. Now to the position at hand. What do you think you would play if this were a blitz game? How about if you had all the time in the world to think about it? Because it was a blitz game, Larry unhesitatingly played 41. Ng6+ Kg8 42. Ne7+, with a draw by perpetual check. As he wrote in his e-mail, "Trying to win with something like 41. Bg6?? loses to 41. ... Rxb2+ 42. Ka1 Rh2+ 43. Kb1 Rxh6, and I couldn't see anything else to try. After all, White is actually down in material, and at least one more pawn is coming Black's way." It threatens 42. Qg7 mate. It blocks the f-file, so that 41. Qf6 mate and 41. Qf8 mate also become genuine mate threats. It deflects the rook, so that after 41. ... Rxf5 42. Bg6 Black no longer has the "miracle defense" with ... Rxb2+ followed by ... Rh2. Finally, it attacks the bishop, so that after 41. ... Rxb2+ 42. Ka1 Rh2+ 43. Nxd4 removes Black's best attacker. Any time you can make a move that does two things at once (such as a fork or a discovered check) it is usually a strong move, so a move that does four things at once is fantastic. It's true, though, that point (3) needs to be looked at more carefully. After 41. Nxf5 Rxf5 42. Bg6 Black's king can run away: 42. ... Kg8. But it doesn't get far, because 43. Qxh7+ Kf8 44. Qh8+ Ke7 45. 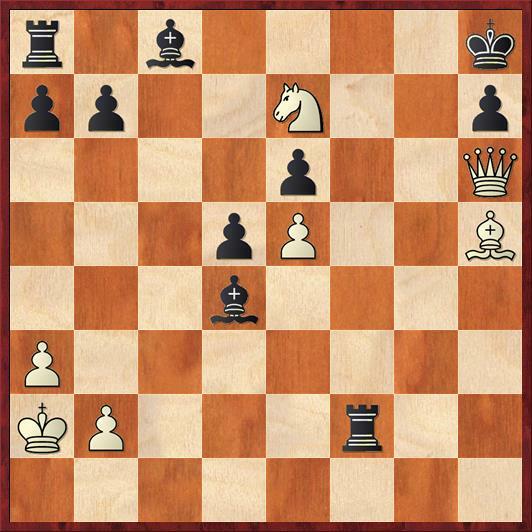 Qe8 mate is checkmate. Whew! Larry said that he got an unusually large response to his e-mail, and most of the people who answered found the same move that I did, 41. Nxf5. But not all of them! Three of the people on his list suggested 41. a4! instead. In fact, when you look at the position more carefully, you'll see that any move that defends against the "mill" threat (i.e. ... Rxb2+ followed by a discovered check) works for White. 41. a4 works. 41. Kb1 works. Heck, even 41. Ka1 works. The point is that Black's rook has too many things to do -- defending against Qf8, Qf6, and Bg6. He needs at least two moves to get any other pieces involved, and he doesn't have that kind of time. This was a bit of a shock to me. So all of the flashy heroics with 41. Nf5, the doing-four-thing-at-once-ness of the move, and the five-move combination ending with Qe8 mate, are completely beside the point. All White needs to do is a tiny bit of prophylaxis, preventing Black's one threat, and Black is powerless to stop mate. In fact, Larry suggests that this position is a chess personality test. I agree! Here's what your move says about your chess personality. (A) If you played 1. Ng6+ ... You are a linear, connect-the-dots, color-between-the-lines thinker. Or else you are in time trouble, or you are so intimidated by your opponent that you want to bail out into a draw as soon as possible. (B) If you played 1. Nf5 ... You are romantic and imaginative, looking for the paradoxical or extraordinary solution in any position. You probably waste too much time looking at fantasy variations and get yourself into time trouble. Your chess idols are Tal and Bronstein. (C) If you played 1. a4, 1. Ka1, or 1. Kb1 ... You are a hard-nosed pragmatist. You prefer thinking schematically to calculating variations. You believe that an ounce of prevention is worth a pound of cure. Your chess idols are Nimzovich and Petrosian.